Within each category, different cards further refine what the spread will reveal. It’s easier to show you than to tell you. 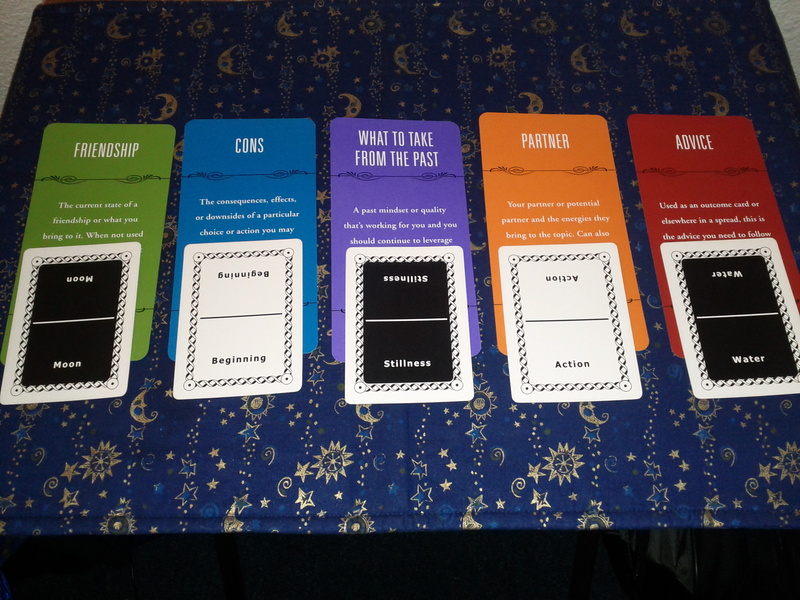 Here’s a picture of a spread my friend Michael created in about one minute by picking one card at random from each of the categories. As recommended by the detailed guidebook that comes with the deck, the first card he picked was the Topic: Friendship. The second card was Influence: Cons. 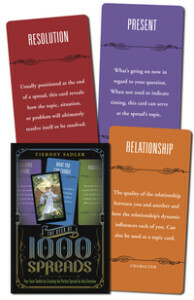 Next came the Timing Card: What to Take from the Past, followed by the Character: Partner, and finally the Outcome: Advice. It was really eerie to see how these randomly picked cards all came together to make a great spread! We used our own deck, The Ultimate Oracle, to pick the cards to go with the positions and created a great reading! We created a spread by picking spread cards randomly, but you can be very deliberate about it. 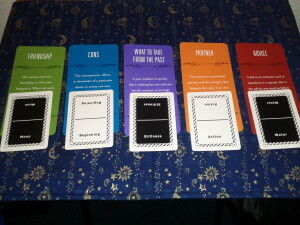 For example, you could create a spread about your business or career by choosing the Career topic card, two Character cards of You and Co-workers or Partner, nearly all of the Influences cards (Clarification, Attitudes & Thoughts, What is Hidden, Surprise, What to Know, Pros, Cons, etc), Timing Cards, and the Advice or Lesson cards from the Outcome category. The hardest part of using the deck is choosing the category cards to use! But wait – there’s more! If you don’t find what you’re looking for with the cards provided, there are even blank cards in each category for you to create your own. Verdict: 2 Thumbs Up – Whether a beginner or long-time Tarot enthusiast, go get this deck from your favorite indie bookseller! I agree, Mary Greer is brilliant, and has some of the best books out there. This deck is more about spreads, which Mary doesn’t address as much (somewhat in 21 Ways to Read a Tarot Card).